Confused by all the talk about inflation and deflation? It seems to be a mystery to most analysts, that’s for sure. Only a few have gotten this mystery right so far and have managed to stick to their story. But now we have a new President, yet more stimulus on the way, and money supplies that are turning up. Surely inflation is in our immediate future, right? This is a crucial concept to understand as YOUR FUTURE MAY DEPEND ON GETTING IT RIGHT. Get it wrong and you risk your retirement, your health, or even jail time by defrauding your investors and jumping out of your airplane sending it crashing into a Florida swamp and riding off on your motorcycle! But hey, I don’t remember any of that so I’ll just try to make it as simple and interesting as I can, but bear with me, it’s important! Ahh, it’s a mystery to most to be sure, so let’s set the tone and mood for this mystery with another mystery... who wrote this song that Roy Orbison sings so beautifully? That deflation is happening is no longer a mystery to most, yet some still choose to ignore all the signs – if that’s you, please go spend some time around Mish’s site and read his list of 15 symptoms of deflation and how we are currently experiencing all 15 on his list (Mish’s articles). People ignoring the signs are most likely the ones whose retirement accounts are now down 40% or more over the past year. By the way, as of today, the Wilshire 5,000 index (the broadest index) is off 48% from its high last October – most people UNDER PERFORM the indices, so where does that leave people and their retirements? Inflating they are not! The only limitation on the Fed and Treasury are the Congress and the acceptance of the dollar and the Bond in a fiat regime. Period. This statement illustrates something that most people are overlooking, a big piece of the puzzle… For I see another limit – that is the limit of people who are supposed to take in and service ever increasing amounts of debt. This debt saturation is a part of the puzzle most economists are overlooking. At some point people must be able to service ever increasing debts with INCOME, not simply by taking on more debt. The inflationist argues that the government can print money until it overwhelms the deflationary forces and causes everything to rise, including incomes. In a closed system, cranking out fiat dollars will indeed eventually cause incomes to rise and will result in a circle of price and wage increases that follow the monetary stimulation. However, our system is “open” to the rest of the world. Free trade has meant that instead of wages spiraling up, the owners of capital have simply moved production overseas where they can get their work done more cheaply. That’s called wage arbitrage. That has and will continue to keep a lid on wage increases, and thus helps to prevent the price of things from going up further in a self-reinforcing circle. Sure, the Government and the banks can “print” all the fiat debt based paper they want, but the key here is that the people who make up this country are already debt saturated and that’s why further inflation at this stage will fail, and will remain failed until the present debt is cleared (or the system is closed allowing wages to increase). 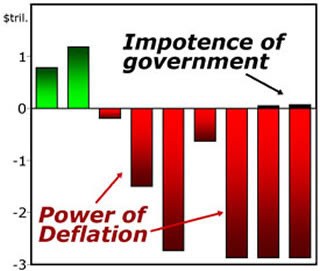 Most people think of inflation as rising prices and deflation as falling prices, but in a macroeconomic sense or monetary sense, inflation is classically defined in very simple terms: Inflation is an increase in the supply of money and credit, while deflation is a decrease in the supply of money and credit. Note that nowhere in the definition does it talk about the price of anything. It is generally agreed that it is the supply of money and credit that eventually LEADS to higher or lower prices. The time period since WWII was an unprecedented time of GROWTH IN FIVE KEY AREAS – MONEY SUPPLY, CREDIT SUPPLY, ENERGY SUPPLY, DEMOGRAPHICS, & TECHNOLOGICAL ADVANCES. All these areas experienced exponential growth at the same time which is the experience most adults alive today know and are familiar with. These forces have all drastically influenced the growth of our economy, but I want to limit this article’s scope to the two areas that I think are drastically influencing inflation/ deflation right now, and that’s the relationship of money and credit. That’s not to say that the others aren’t important and very influential, they are and each is worthy of their own paper. When I set out to understand complex ideas, or to worse-case some particular outcome, I start by ISOLATING THE VARIABLES IN MY MIND, and then I take them to their EXTREMES by asking myself what would happen if_________? So, let’s start down the path to understanding deflation through the use of a little mental exercise to judge and illustrate the effects of each variable. 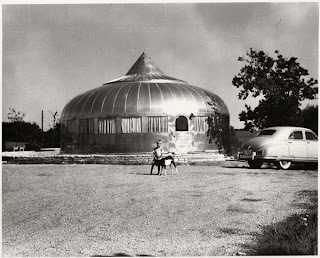 To start this “mind game,” imagine a big funky circular building – much, much larger than the one pictured! Imagine that building is isolated from the rest of the entire world… inside is an ongoing money experiment where we get to play the role of central bankers and manipulate the parameters that the people inside the experiment have to live and abide by. Oh, what fun! In effect we all get to become manipulative pigmen – errr… central bankers! Inside of that circular building lives 100 people. Each has a room around the exterior wall for their living space and the center is where they all go to work to exchange goods and services from one another. To kick this experiment off, we have supplied each of the 100 people with $200 total. One hundred dollars ($100) in cash and $100 in the form of a loan which they must pay back at the rate of 10% per year - credit. In effect, they have borrowed against their future labors and must work to pay us back (Where did we get the money to give and to lend? Oh, we just made it on the copy machine!). For those not familiar with the various money measurements, please visit Jesse’s Café again for the best and most simple Primer on the money supply there is. 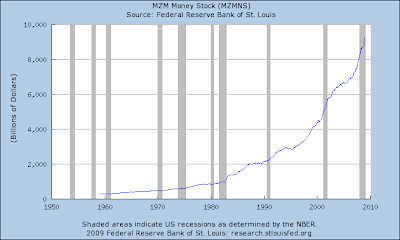 If we zoom into the M1 chart we can see the recent sharp acceleration in this small measure of the money supply. 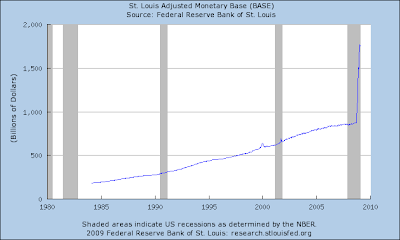 Sure looks inflationary, right? No doubt about it, those charts do not show constricting money supply – quite the contrary, they show a parabola that has now launched into a parabolic blow off phase, especially base money. Heck, that has to cause inflation, right? If not now, then soon, right? Because the supply of money is increasing dramatically, no doubt! 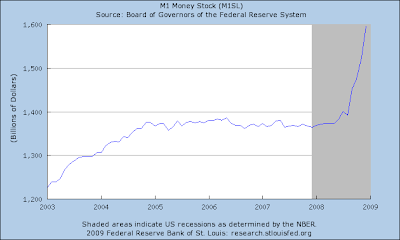 Just to confuse the issue a little, here are the latest PERCENTAGE changes in money supply as reported by John Williams at Shadowstats.com. Note how he shows the percentage rise in M3 (which he still constructs himself) as falling over the past year or more. While the growth was slowing, it was still positive and growing. Well, how can it be that the PRICES of stocks, real estate, commodities, and almost everything is falling while at the same time money is growing? Ah, the mystery! 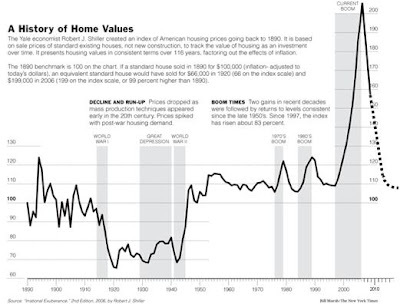 It’s what you won’t find on any of these charts that is confounding economists and is thus creating the mystery. One thing you WON’T FIND ON MONEY SUPPLY CHARTS IS CREDIT – this is the mystery. Yes, the supply of money is increasing, but all those measurements reported by our government do NOT track the amount of CREDIT created in any way shape or form. This brings us to the point where it is helpful to understand that although credit money spends like any other form of money in the short run, it must be paid back at some point (with interest) and is therefore NOT counted in the money supply measurements above. That doesn’t mean that they were not created and spent, they were. Thus, the total effect on PRICES is NOT JUST THE MONEY SUPPLY, but it is the combined effect of MONEY AND CREDIT. Let’s play central banker/pigman for a second and experiment a little inside our CLOSED circular building. Inside people are getting up in the morning and getting ready to go to “work.” They go to the common areas in the center where we find that some budding entrepreneurs have set up small businesses of all sorts, some have even been so bold as to start up stock and bond markets. Some have little farms and produce food, while others make clothes and they all trade back and forth with one another using their fiat dollars as a medium of exchange. Each morning, John, the carpenter, stops by Suzie’s Bar & Grill for breakfast where he buys his usual “sunrise” bacon, eggs, and toast for which he pays Suzie 25 cents. Now imagine that one morning we print up some more base money, say a huge amount in relative terms, like $1,000 for each – and we force every person to take it as a personal loan. That’s 10 times the amount of the original base money, and now we have 11 times as much credit money as base money and NO ONE inside knows how much “money” is in circulation, but we know there is now $10,000 base money and $110,000 in credit money. When we do this, what do we find? Well, for starters, John figures that he doesn’t need to go to work to earn only $1.50 a day when he has enough money to just kick back for a while! But wait… there’s a problem with that theory in that Suzie is no longer willing to get up early and slave to make everyone breakfast for only 25 cents. No, now she wants $2 for the same plate. And thus, the increase in money supply (inflation) resulted in price increases AND since prices rose so much, John now demands more for his work and along comes WAGE increases. And guess what? Now WE’RE collecting transaction fees and interest on the credit money and we get to pull in our “profits” taking from the non-credit base money supply. Since we’re omnipotent, we get to enter the building and use that printed money to hire John to build our new house in the Hamptons, and heck, since we’re stopping by we might as well use some of that money to have Suzie cook us breakfast. We central bankers love watching Suzie work while she believes she is receiving something real in exchange for her labor when in fact we are using the very same money we created out of thin air to begin with – ha! What production have we added? Well, we did walk over to the machine and print off some paper after all! This works for a while, but unless we keep adding credit, eventually prices and wages stop rising. But if we do continue to feed in credit dollars… up, and up, and up prices and wages go until one day we are printing 100 billion dollar bills like Zimbabwe and Suzie wants billions just for a cup of coffee! Getting and creating credit money requires almost no effort. There is certainly NEVER AN END to the theoretical SUPPLY OF CREDIT THAT CAN BE CREATED. There is one and only one REAL limit to credit money, and that is the ability of borrowers to pay it back – outside factors may influence that ability, but their affects will be indirect. And the truth is that credit money is so easy to create, why would the creators of that money really care if a bunch of people can’t pay it back? There are TWO AND ONLY TWO ways to pay back credit in the real world. One is to pay it back (with interest), and the other is to default. All attempts to manipulate the supply of money and credit will result in a circular motion of devaluing the currency and the purchasing power of those who produce. Try raising the supply of money or credit drastically inside of that building… did anything really change? At what point does it change? Credit (debt) is simply the means by which you can pull forward in time future income. Once ALL future income has been pulled forward, you have at that point reached what I call macro debt saturation, and I believe we are at that point already – total incomes are not sufficient to make the total debt payments at the current low interest rates, much less at higher ones. How do I know that? Because I added up all the debt (using conservative numbers and even excluded state and local government debt), divided that number by the total people in the United States and found that each person owes a staggering $303,053, or $1,212,212 for my family and every other family of four in America. And this is before the latest bailout trillions. In my article, Death by Numbers, I spelled out how the SAME 305 million people are ultimately responsible for ALL THE DEBTS that exist in America; governmental, corporate, and personal. What I didn’t cover is the fact that there are only 156.3 million taxpayers in the United States and that when you divide the total debt and obligations by that figure it equals an even more staggering $591,370,217 PER TAX FILING WAGE EARNER (how many of those get their wages from the government?). Since I know that the per capita income reported in 2006 was $36,714 (household income = $50,740 in 2007), there is simply no way that $37,000 of income can support nearly $600,000 in debt!! Heck, it takes more than $38,600 per year in payments to service that much debt for 30 years at only 5%! Thus, you can see that ALL future income has been pulled from the future into the present and therefore ALL future productivity goes to servicing the debt and obligations already made! So, go ahead and dream about cutting those debts and obligations in half. In that case you still have more than half of all income going to pay back debt, leaving little room to pull future income into the present through further debt creation, and thus little hope to create further growth through credit creation. No, you won’t find government reports that do this type of totaling of the debts for you, and you won’t find any Ivy League trained economists adding up all the debts for you either, Mr. North (Article by Gary North). And while we’re talking income versus debt, our Federal Government’s current income is falling with the economy and last year totaled $2.7 trillion which has to service an already admitted to $56 trillion in current debt and future obligations – before counting all the bailout trillions! Thus, the gap between our nation’s income and expenses is growing while their solutions include cutting their income further (cutting taxes) and raising their expenses (stimulus spending). That’s some kind of math! And don’t look now, but State and Local governments are in serious debt trouble too. Where’s the money come from to make up the short falls? Well, it ultimately has to has to come from either the taxpayer or the printing presses – no, borrowing money from foreigners won’t do it as all that does is pull forward in time future productivity, and cause borrowing costs to climb, just like any loan does. And that brings us to a system that is not closed, but open. Let’s visit our circular building and do a little modification to the rules, we are after all, “one world” proponents! Let’s say that while at the same time we’re flooding the building with credit money, we go to Siberia and find a Russian master craftsman who is willing to do the carpentry work on our house in the Hamptons for half of what John in our experiment wants! That’s a great deal for us, but what is the effect on the experiment? Well, John is now unemployed and looking for new work. He’s up to his eyesockets in debt and can no longer afford to make rent payments, loan payments, or to buy breakfast from Suzie. Hmmm… this means that maybe Suzie can’t keep raising her prices and maybe John is going to have to share a room with someone else for awhile until he can get a job. Oh, and since we own the building, we just lost one hundredth of our rental income too. 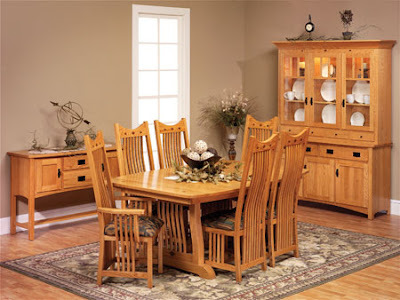 Seeing that the Russians will do carpentry work for less, John is now forced to bid less on future jobs and anyone else in the building wanting to do carpentry work is thus limited too. Now imagine that everyone inside that building can order goods and services on the internet, from their rooms, and outside of the building to be delivered inside. What happens to the ability to raise prices and wages? Could it be taken to such an extreme that even though you are flooding the room with credit dollars that all those dollars simply leave the building and thus cannot create price inflation? Now, I know all you classically trained economist will poo paw this and find other reasons for the drop in velocity, but I say that you simply need to spend a little more time in that building and you will see exactly why velocity is falling. If you were carrying high levels of debt and receive money, what do you do with that money? Well, if you want to stay “in the game,” then you use it to pay your creditors. In the real world, money and credit are being PUSHED by the people who profit from it. With every nook and cranny already saturated with debt, the banks cannot find businesses and people who are still credit worthy enough to take the loans under reasonable and rational standards. Thus, the money now sits at the banks and goes nowhere. Not only can the banks not find enough new qualified borrowers to keep the credit growth growing, but the borrowers themselves are finally saying enough is enough. Result? 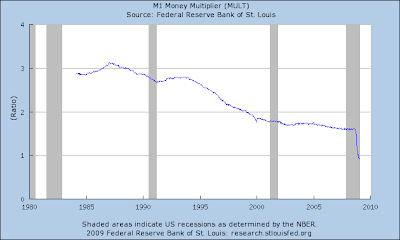 A major decrease in the velocity of money! PHEW! We have said quite a mouthful, but we still haven’t totally unlocked the mystery of deflation and why so many people failed to see it. It is complex in the number of pieces involved in the puzzle, but when you take it one piece at a time it’s simple and makes sense, but is never as easy in real life as it is in academia. By now most people understand how credit was taken and “securitized” into debt derivatives. What most people still do not realize is that debt is leverage. What the bankers did was to create even more derivatives of these derivatives – the shadow banking system – piling leverage on top of leverage. The upshot of which is that when you are leveraged, small losses can turn into big ones, and when you pile leverage onto leverage, small losses can become gargantuan. Since the shadow banking system was completely unregulated and untracked, it grew to proportions that are incomprehensible. How large? 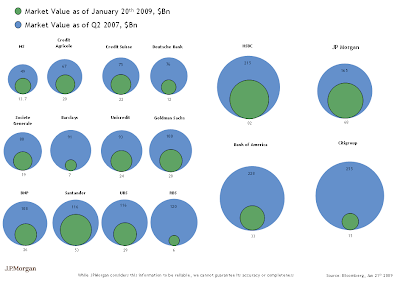 • U.S. commercial banks reported $6.0 billion of trading revenues in cash and derivative instruments in the third quarter of 2008, compared to $1.6 billion in the second quarter of 2008 and a $2.2 billion average over the past eight quarters. • Net current credit exposure increased 7% from the second quarter to $435 billion, a level 73% more than the $252 billion exposure of a year ago. • The notional value of derivatives held by U.S. commercial banks decreased $6.3 trillion in the third quarter, or 3%, to $175.8 trillion. • Derivative contracts remain concentrated in interest rate products, which comprise 78% of total derivative notional values. The notional value of credit derivative contracts increased by 4% during the quarter to $16.1 trillion. Credit default swaps comprise 99% of credit derivatives. whose activity is not reflected in the data in this report. Second, because the highly specialized business of structuring, trading, and managing derivatives transactions requires sophisticated tools and expertise, derivatives activity is concentrated in those institutions that have the resources needed to be able to operate this business in a safe and sound manner. Third, the OCC has examiners on-site at the largest banks to continuously evaluate the credit, market, operation, reputation and compliance risks of derivatives activities. In other words, they don’t really know how much are out there, they are so complex that even they can’t figure them all out, there is no such thing as “safe and sane” credit derivatives, but not to worry, the OCC has examiners on-site to measure compliance! Ha, ha, compliance of what? There are no rules! The bottom line is that credit derivatives in the United States are massive and they are out of control. 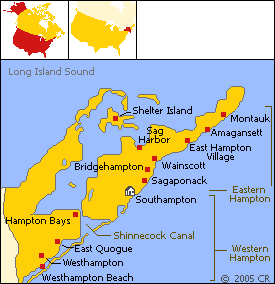 And that’s just in the United States. The rest of the world is largely just as polluted. So, how can we know if the destruction of credit money outweighs the effects of new efforts to inflate the money and credit supply? Well, the analogy I like to use is that the tool box of the government is being swamped by the tsunami of wealth and credit destruction. To get a sense of the scale of the wealth destruction occurring, keep in mind that the notional value of the entire stock market in the U.S. peaked at about $16 trillion in October of 2007. Since then, the Wilshire 5,000 has lost nearly half its value or nearly 8 trillion, just in stocks. Then there’s sharply falling wealth in residential real estate, commercial real estate, contracting credit for mortgages, second mortgages, credit cards, automobiles, and debt of all kinds. And to get a good sense of the scale of the government’s attempts to stimulate growth versus the effects of the deflationary tsunami, Martin Weiss did a great job of trying to quantitatively show the scale of the two forces in his article Biggest Sea Change of Our Lifetime! This article is worth a read to understand the scale we’re talking about. In this simple chart, Weiss shows the scale of the TARP money (little black slivers on the right) compared to the scope of the wealth destruction which is obvious. I could write an entire book about the subject of inflation versus deflation, but I think we have uncovered enough of the deflationary forces for now to uncover the mystery of why it is deflation that we are currently experiencing. The question then becomes how long will we experience deflation before inflation begins again? That is not knowable for certain, but I would estimate that IF our currency survives in its present form, deflation will run AT LEAST until the second quarter of 2010. I base that estimate on the experience of the collapse of the stock market in the early 1930’s, the collapse of the Nikkei index in 1990, and our own NASDAQ crash in the year 2000. All of these episodes ran approximately 2.5 years in the equity markets and much longer in real estate. Our equity markets peaked in October of 2007 and thus a similar timeframe would place the bottom of the stock market around May, 2010. Keep in mind, however that in per capita, inflation adjusted dollars, debt levels heading into this deflationary period are about 2.5 times as high as they were heading into the Great Depression. Those who say that the government can create enough money and credit to overwhelm deflationary forces have been, and will continue to be, wrong as the deflationary forces are simply too large. The amounts of money required to overwhelm deflation would immediately put and end to the financing of our Treasury debts and would lead to sky high interest rates. But before it could ever get there, they would need willing borrows to accept the new credit, and those willing borrowers are simply too few in number to create continued never ending growth. To save the present money system from the weight of collapse, the only solution left is to clear the current debts FIRST. At the start of this mess, we still had a chance to do that, but our elected officials instead decided to socialize the losses while letting the central bankers keep their privatized profits. Where has the money that we’ve given them gone? They’re not talking, it seems they would prefer to keep it a mystery. And here’s why you don’t hear Bono’s version on the radio – LOL, no mystery there!